Take in the impressionistic brushstrokes of Owen Drysdale’s Hot Summer Deadly Day on view at the Barbara Davis Gallery through Friday, September 2, 2016. Barbara Davis Gallery presents a solo exhibition by emerging New York artist Owen Drysdale which pairs well with the brutal weather we are all far too familiar with this time of year. Inspired by memories and associations of a town in the heavy heat of summer, Drysdale uses familiar faces and landscapes as a point of departure that takes viewers to an altogether new location through gestural marks. Parking: Free parking is available in two lots next to the building. Catherine Gonzalez is an arts absorber, administrator, and blogger originally from Austin, Texas. She graduated from the University of Houston with a B.A. 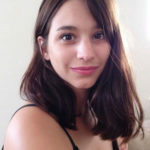 in Art History and runs the Bonphilosophia arts blog, where she interviews and documents up and coming artists. In her current role at Houston Arts Alliance she supports online communications as well as all of HAA’s outreach opportunities and volunteer network.